Faye played for Arsenal Ladies in the FA Women’s Super League and the England women’s national football team as a central defender. One of the most recognised and respected players in the women’s game, Faye was a commanding presence at the heart of the Arsenal and England defences since the late 1990s. 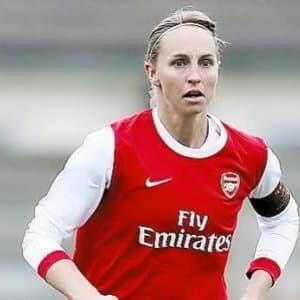 As Arsenal club captain Faye, was one of English football’s most decorated players – having won 27 honours in 15 seasons with the Gunners. A great leader and role model, Faye had the honour of receiving an MBE in 2006 and has captained her country in four major tournaments, seeing England all the way to the Euro 2009 final and to the last eight of the 2010 World Cup.